As final step URL rewriting has been enabled in the joomla global configuration ( moving .htaccess into place). After installing the component their should be a thick red line telling you to import the feeds. Let's do it. You can't click on the line above, click after installing the component. If everything goes well after clicking the link you should see some information about the feed import. If not, one problem might be a writeable cache directory. please ensure .../administrator/cache is writeable for the webserver. Head over to the datafeeds component (menu components->datafeeds). Their are some pre installed feeds. Open the 'sunweb' feed. On the upper left is the 'Feed configuration'. This depicts what to fetch (feed url) How to fetch/preprocess (the parser class) and how to postprocess ( the callback/filter). The lower left is the important section, here you will map 'feed fields', basicly what you see in the example feed data to the database fields. 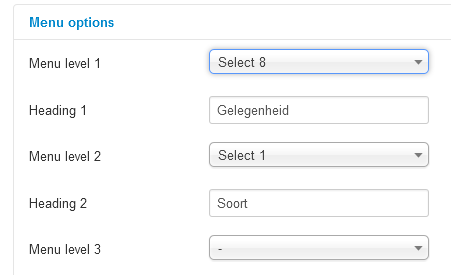 For other topics the Select fields will have a different purpose, for example fashion then Select1-Gender, Select8-Color etc. Now we can start building a site. Head over the menu's>Main menu->add new menu. Add a title to the menu, this one should be travel related so it's called 'Vakantie Overzicht'. Leave the rest untouched save and head over to the front and visit the newly created menu. You should see the items from the feed now, it might be messy with travel and flowers from both feeds mixed up. We will get to that later. Now let's add a navigation menu first. You can't navigate the items using joomla menu's you will need a module for that. head over to extensions->module manager. Now their should be a navigation menu to the right on the site. The first section shows the structure of the menu including the headings used in the navigation module. Let's change that a bit. Saving the menu will show a different structure in the navigation menu.Their are some more strings under string options' alter as you like. Now to remove the flowers. In 'Advanced options' open the 'filter options', this allows to filter parts from the dataitems based on the Select fields. 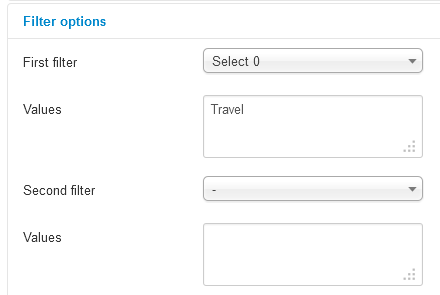 For the travel related sunweb feed the Select0 field has the value 'Travel' so we can filter on that one. In general I would not recommend to sell very different product categories on a single site, neither to create to many menu's. Most sites can run using a single menu item. 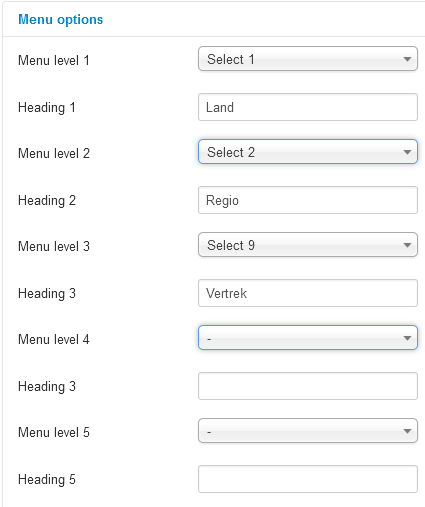 The second section of the advanced menu options in the menu configuration allows to select some display options like the layout to use number of items etc. There are two parts, one for the first page of the menu item , and one for all other. the sort is on 'added' 'highest' first, so the page will show the newest items first. 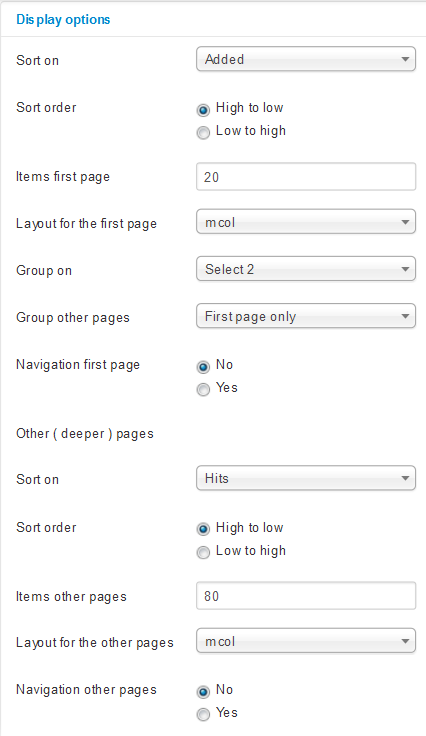 the page will group on 'Select2', this ensures that for every value of Select2 ( that's the region ) only one item is shown. here the sort is on hits, most clicked first, 80 items using the mcol and no page navigation.